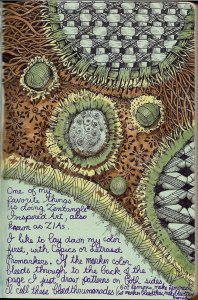 I decided that for the second round of the Rhodia Journal Swap, I’d go back to what is easiest for me, and most representative of my work, Zentangle®-Inspired Art. I’ve already colored up my seven pages, so they’ll be bleedthrumanades, too (got lemons, make lemonade. Got marker bleed-thru, make bleedthrumanade), but I’m not going to work them up as such. Florida beckons, and I’ll be leaving hubby and home next week, for 14 days of sun and family. I’m hoping to get as much of this done as possible before then, without rushing it, so hopefully, you’ll see lots of Rhodia journal for the next few days. You can see what the other members of the swap are doing at the Rhodia Journal Swap page on Tumblr. Hey! There is Curio! I adore how you have shaded it! So wonderful! Beautiful work as always. I hope you have a great trip to Florida. Soak up some sun for me! ooops, something happened when I tried to leave my last comment. As I was saying, I generally just lurk on your blog, but today had to leave a comment about your beautiful journal swap. At first glance, I thought you had included fabric. The tan/black background & the 'sunflowers' appeared that way! This is beautiful! Your Zentangles always inspire me! Thank you!